Ottawa artist Paul Sharp was in Japan during the 2011 tsunami. The devastation had a profound effect on the artist and changed the direction of his art. Sharp is exhibiting these Japanese-inspired works at La Petite Mort Gallery until Aug. 31. Here, ARTFUL BLOGGER talks with Sharp about minors, pessimism, and taking responsibility. ARTFUL BLOGGER: The title of your exhibition, “A Minor’s Backstory of Stones”, is intriguing. Can you explain what that title means? PAUL SHARP: Years ago I started portraying the unrepentantly animal elements of immature children’s faces to calm a bout of nostalgia I was having for my years as a teacher. 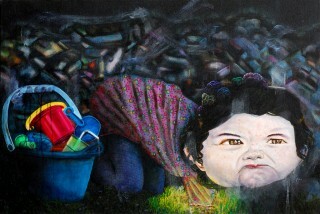 I discovered that, compared to capturing adults, it was easier for me to convey emotions by painting children. 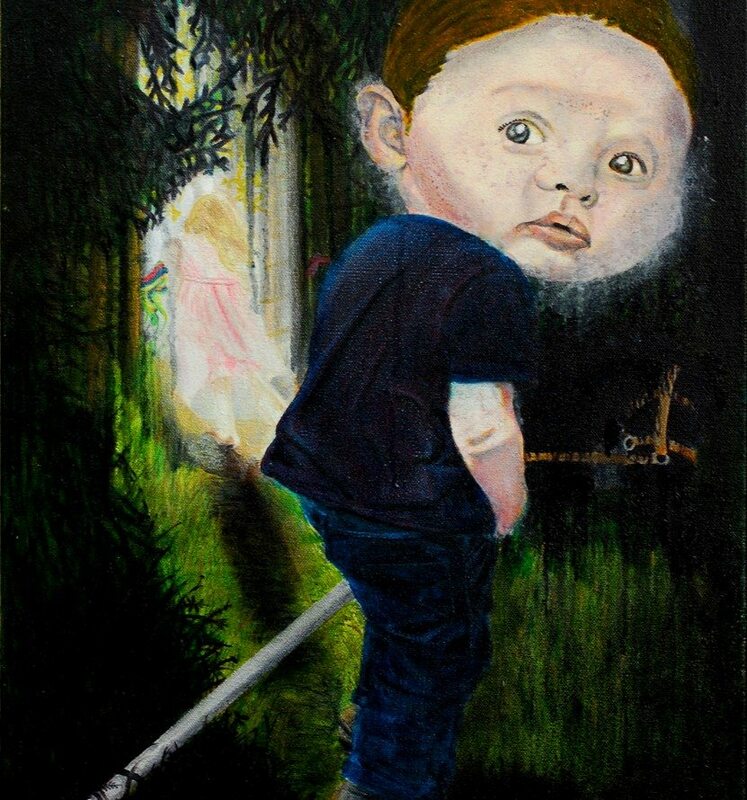 Since then “minors” have become a basic element of my paintings and they have traveled with me from canvas to canvas, keeping me company over the last five years. The “Backstory of Stones” references the Sunday school message, “let he who is without sin cast the first stone.” These paintings turn my experiences into introspective parables that dwell on how, instead of looking inward and taking personal responsibility, I have often blamed others for the problems in the world. Dredging my memory for the subjects of these paintings, I’ve painted my history rich with greed, envy and desire that contribute, on a personal scale, to big social problems we’re facing today. Working on this show has made me more patient, and less likely to be casting stones at anyone, to the great relief of the authorities. AB: As I understand it, your paintings probe autobiographical details through the lens of the wreckage of the Japanese tsunami. Why the marriage of these two things? PS: I started working on paintings with the aim of chronicling my own past. 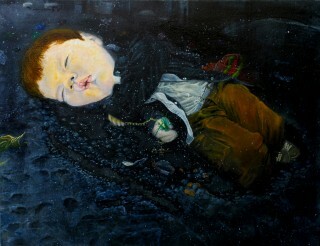 After visiting the tsunami-devastated areas in Japan my goal for these paintings, to merely catalogue my past, changed. I spent five days in the area devastated by the water, talking with people and walking through the ruins. In the beginning I was very confused about the experience. I realized that my confusion arose because it was impossible to blame anyone for the tsunami. I needed to experience a colossal act of nature to realize I am wearing-blame tinted glasses that every day colour my view of the world. The paintings, instead of simply cataloguing my past, became about examining my own responsibility for the shape of our world and examining how my footprints have contributed to environmental catastrophes, epidemics and war. An example of the above can be found in the painting, Fancy Fever (above), that reflects on my yearning for material things, epitomized by innocent recollections of disappointment over never having anything to play with in spite of owning a mountain of toys. The girl is crying, despite the pile behind her, because her supply of treasure has finally dried up. AB: This body of work is rather bleak. Are you, by nature, a pessimist? PS: That’s funny. My wife often accuses me of being too optimistic. Most of my other paintings have been playful. This is my first series of darker paintings. I genuinely believe that people are problem-solvers if only we can get on with the hard work of making change. The hard part is getting past our hang-ups. I hope people look at these paintings and dwell on the fact that the world exists this way because of us, and some of our most cherished behaviors have negative consequences. In fact, I hope I’m not being too optimistic by believing that, like people have done for the last 15,000 years, we’ll be able to overcome the big problems bearing down on us.